When closing your garage door does it slowly slide up? Do you feel or hear it hinge as the associated shutter starts to move? Does it often get stuck while moving down? These are all symptoms that there is something wrong with your garage door rollers. While there could be other problems materializing similar symptoms in most cases, it is a bad set of rollers which are making it difficult for the garage door to close and open. When garage door rollers are worn out, but not replaced or repaired in time that exerts undue pressure on the track along with its associated joints. If you have a similar problem and have no idea what to do then call Elite Garage Doors today. How to Diagnose a Problem with your Garage Door Rollers? Before you can decide on getting garage door replacement rollers, you need to figure out if in fact they are worn out or broken. To do this observe how your garage door opens and closes. Usually, it will be very difficult or even impossible for the door to move. Inspect the rollers, and if you see cracks, or chips or perhaps missing pieces, then the rollers need to be replaced. Dragging: The overhead garage door spring holds a great deal of tension which makes it easier for the door to close and open. If the spring is fine and there is still resistance when you attempt to move the door, then the rollers are faulty. Frequent Clicking: You may sometimes hear a clicking sound each time the door is closed or opened. The clicking is a result of a misaligned piece that tries to move off track and then realigns itself. The clicking if not fixed in time can cause the garage door roller to pop out. Grinding Noise: When you hear noises similar to grinding metal on metal, that’s an indication that the rollers so weak or worn out that they are causing metal parts to rub and create friction. If the grinding is not fixed it can cause the tracks to break and wear off too. What Causes Garage Door Roller Issues? Generally, we’ve seen that it is a lack of lubrication. Home and business owners have not been lubricating the moving parts frequently. Lubrication can make it easier for the roller to move and reduce the instance of metal on metal or plastic on metal (whichever may be the case). 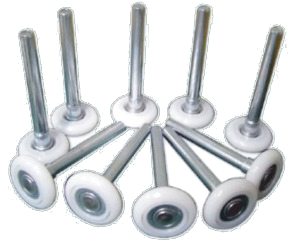 Garage door rollers can also be affected by adverse weather like quick cold and hot snaps. They cause the metal parts to expand and contract rapidly leading to misalignment. So, you’ll want to make sure that the garage door is adequately winterized. Whether your garage door roller popped out or if you think a replacement is needed we can help you. We have the tools, technicians and the expertise to quickly fix all your roller related issues. Call us today!